In their first innings, the Indian batsmen, with the exception of centurion Cheteshwara Pujara, gifted their wickets away. But in their second innings, things have changed for their own good as they are looking to apply themselves in the middle. If not for Pujara, India would not have made 250 in the first innings. At the end of the second day, Australia were 59 runs behind the Indian score with three wickets in hand. Indian bowlers who bowled exceptionally to the top-order could not wrap up the tail-enders. On the third day, Australia added 44 runs to their total before getting bowled out. For the last four wickets, Australia added 108 runs, thanks to Travis Head's half-century. As a result of the efforts from Australian lower order batsmen, they could reduce India's lead to a small margin. Indian openers - Murali Vijay and K Lokesh Rahul - started the innings cautiously and saw off the threat of the new ball. The two batsmen have added 63 runs for the first wicket - their first half-century opening partnership in a long time. The partnership meant that India went slightly ahead of Australia after the rain interruption - which nearly wiped out most of the morning session. By taking the wickets of both the openers before Tea, Australian bowlers ensured that the visitors did not run away with the game. The two wickets meant that the responsibility of building on the good start went into the hands of first innings hero, Cheteswara Pujara, and the Indian skipper, Virat Kohli. The two dependable batsmen built a 71-run partnership for the third wicket and kept India ahead in the game as the lead went past 150. 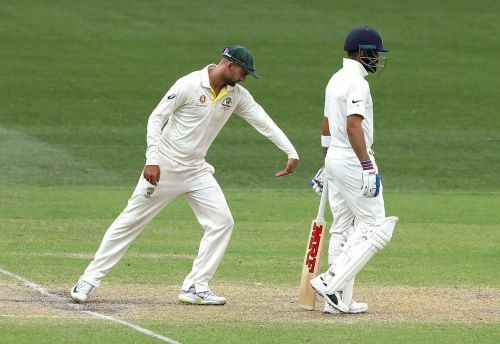 Just when the partnership started to threaten Australia's position in the game, Nathan Lyon dismissed Kohli. Even after losing Virat's wicket, India still hold the edge over Australia as they lead by 166 with 7 wickets in hand. Shastri- It's been 8 overs and KL Rahul is still playing. India must use each review carefully with Llong threatening to strike more than Lyon. Did Vijay tell Rahul that someone hacked his Instagram? Before being surprised at Pant sledging X/Y, remember guys, he attempted to do it even to Kohli, his national captain and world boss. Nothing should raise your eyebrows anymore. Celebrate honest hardwon triumph .